Woodcliff Lake, NJ – October 23, 2013… BMW today announced the US launch of a new line of BMW M Performance Parts developed specifically for BMW M5 and M6 models. One of the highlights of the original BMW M Performance accessory is the M Carbon-Ceramic Brake System, exclusively designed for the most powerful BMW M models and currently available as original equipment. The system’s brake rotors, made of carbon ceramic composite are characterized by even higher heat resistance, low weight and exceptionally high resistance to wear. M Carbon-Ceramic Brakes are offered in conjunction with 20-inch M light-alloy wheels and feature brake discs with a diameter of 16.1inches (410 millimeters) on the front axle and 15.6 inches (396 millimeters) on the rear axle. Deceleration forces are transferred by a combination of 6-piston, fixed caliper brakes at the front and single-piston, floating caliper brakes at the rear. The M carbon-ceramic brake system weighs 42.8 lbs (19.4 kilograms) less than the series production version. The reduction in unsprung masses in conjunction with further enhanced deceleration values, which also remain constant under the highest loads, make an additional contribution towards the outstandingly precise and agile handling of these high-performance sports cars. Offering a combination of lower weight, increased performance and a unique sound, the BMW M Performance Exhaust System was jointly developed by BMW M GmbH and exhaust specialists Akrapovič and is made completely from titanium. The BMW M Performance Exhaust System is offered both for the BMW M5 and for all variants of the BMW M6, it further enhances the characteristic sound of the 560 hp high-revving M Twin PowerTurbo V8 engine. Akrapovič, -also an official partner of BMW Motorsport- is one of the leading manufacturers of titanium exhaust systems. Thanks to the use of this material, the BMW M Performance Exhaust System is exceptionally heat-and corrosion-resistant and lightweight. The reduction in weight compared to the standard exhaust system amounts to more than 22 lbs (10 kilograms). BMW M drivers not only enjoy a racing feel on the road, but also the dynamic potential of their vehicle when driving on the racetrack. 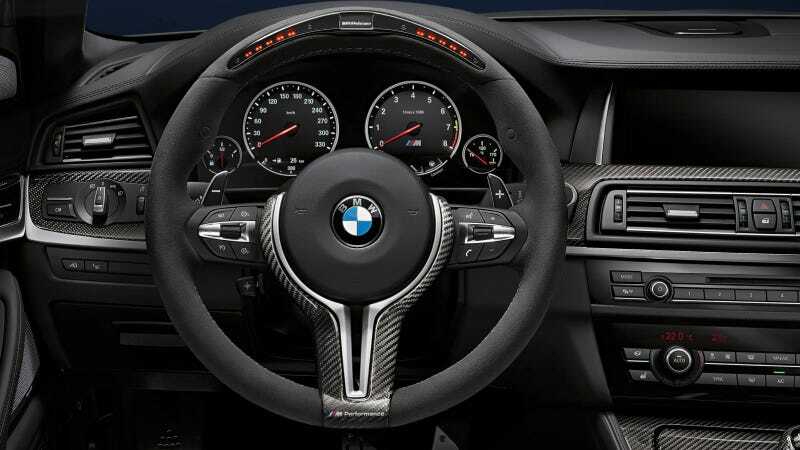 A striking example of this is the BMW M Performance Alcantara leather steering wheel and the race display. On the display integrated into the top center of the steering wheel rim, the driver is now provided, among other functions, with gear shift information as well as lateral and longitudinal acceleration values. Moreover, lap times in minutes, seconds and hundredths of a second can be displayed and saved. Furthermore, the range of BMW Performance cockpit accessories includes carbon trim for the shift lever of the double clutch transmission, carbon interior trim, stainless steel pedals as well as BMW M Performance floor mats. The exterior of BMW M5, BMW M6 Coupe, BMW M6 Convertible and BMW M6 Gran Coupe models can be additionally individualized by carbon mirror caps and a BMW M Performance high-gloss black front grille designed exclusively for each specific model. BMW Performance accessories for the M5 Sedan and all M6 models will be available in BMW Centers just in time for the holidays.